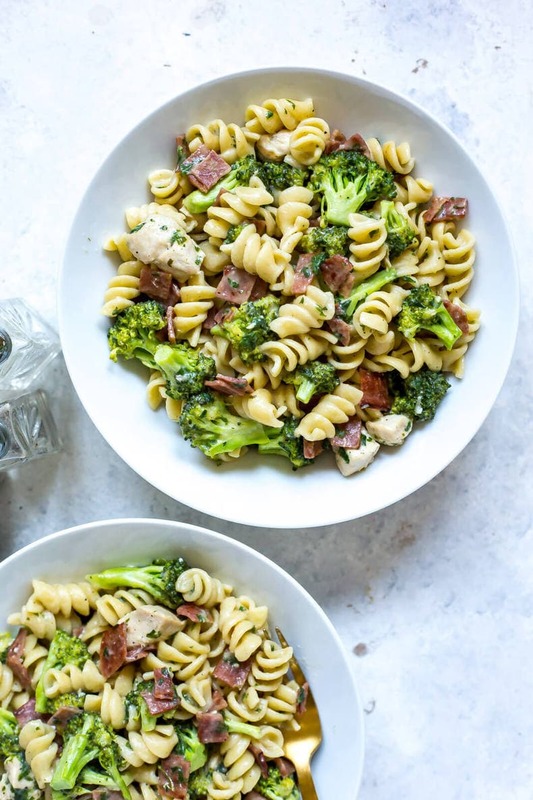 This Instant Pot Chicken Bacon Ranch Pasta is a delicious one pot dinner idea that comes together super easily in the pressure cooker – and it's made lighter with packaged ranch seasoning, turkey bacon and Greek yogurt! 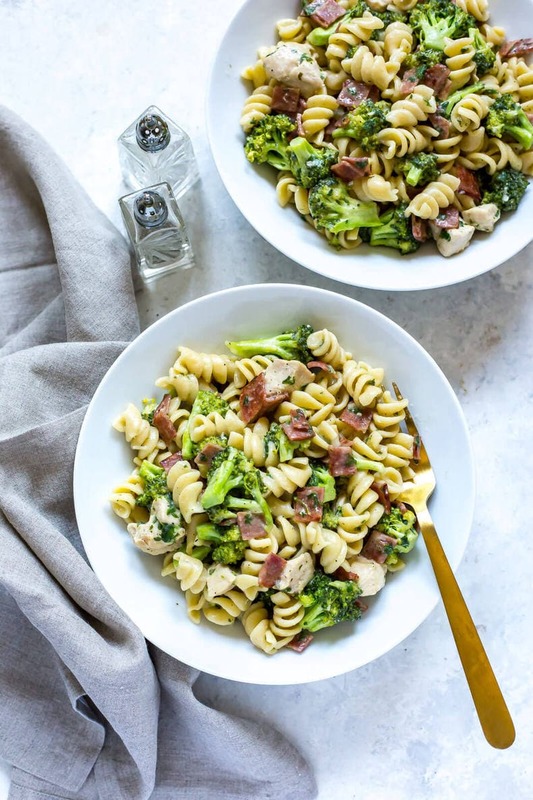 I don't know if I could love Instant Pot Pasta much more than I love this Chicken Bacon Ranch Pasta with broccoli. 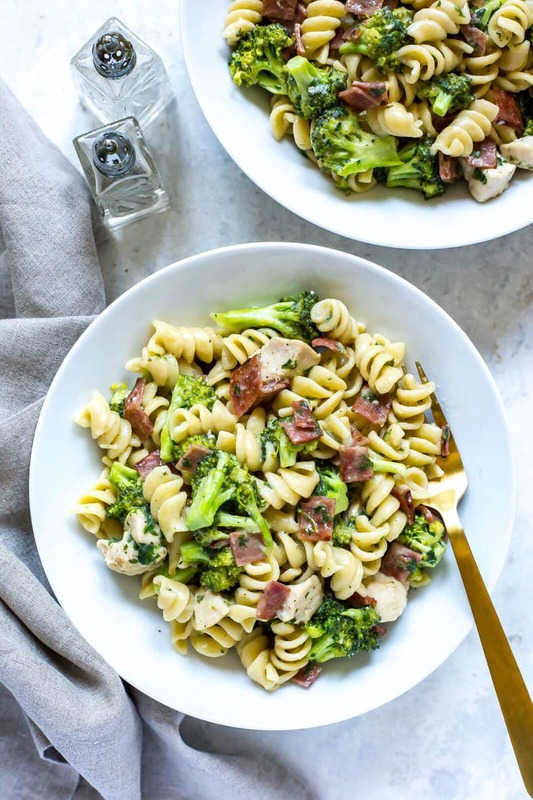 Honestly, pasta and broccoli are a match made in heaven and you're probably going to want to make this every single week. I don't know why I ever made pasta on the stovetop before because one pot pastas made in the Instant Pot are so easy and the best way to meal prep. When I don't know what I'm going to eat for dinner and have a crazy jam-packed week where I know I may not have time to cook, I definitely turn to the Instant Pot just because it makes such a giant amount of food. 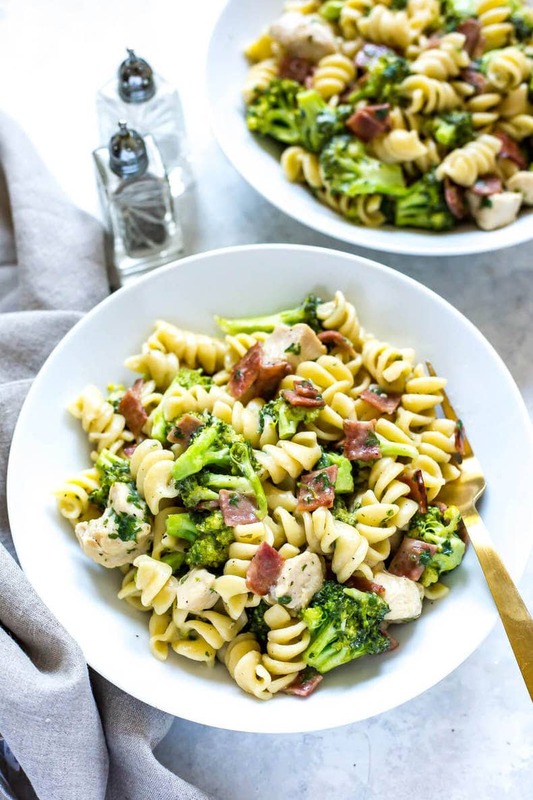 If you're worried about eating too much pasta and carbs you can also do what I do sometimes and cut the amount of it in half and double up on the veggies and chicken – and trust me, with this ranch seasoning, you're still getting all the flavour! 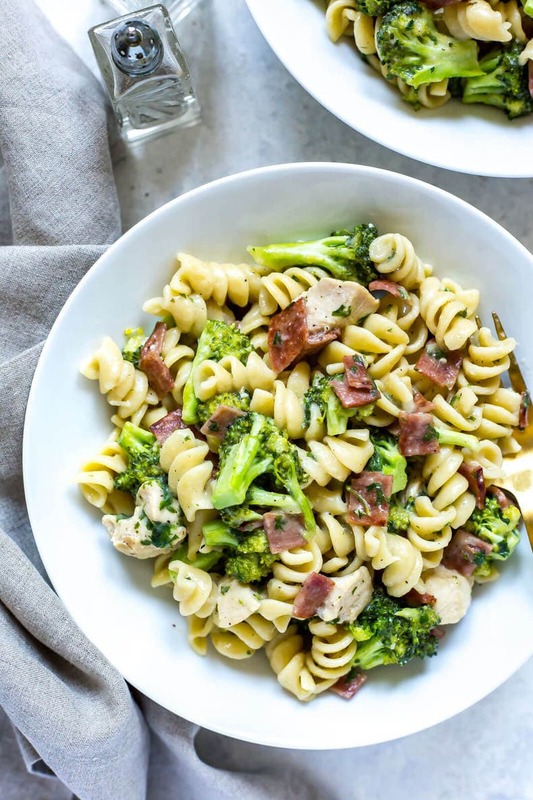 If I had to critique this Instant Pot Chicken Bacon Ranch Pasta at all though is that it could definitely use some more veggies. In order to keep things simple, I just used broccoli and a bit of chopped up parsley but later on when I reheated it throughout the week for lunch I would sometimes add in some extra veggies, whatever I had on hand in the fridge – anything from red pepper (you could also do roasted red pepper) and red onion to sliced zucchini and sauteed mushrooms. Really, this pasta is super versatile and the sauce can be made from mostly pantry ingredients and things you already have on hand in the fridge. I've been loving Greek yogurt and sour cream in pasta dishes – the first time I encountered this trick was with a tasty Pasta Nicoise that I made from the 2018 Milk Calendar and it's definitely a great way to cut calories and keep it light and refreshing – nothing too heavy and no special sauce to mix up. From there you'll want to add just a bit of cheese. I opted for fresh grated parmesan cheese because it blends easier but you could definitely do cheddar as well. That's another thing I added in after the extra veggies and OMG it was so good. 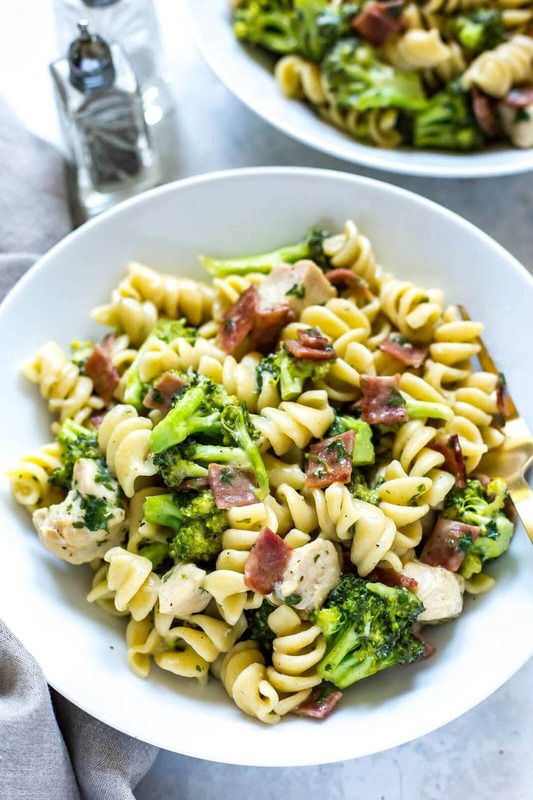 Once you've got your Greek yogurt and cheese, it's just a matter of using a packet of store bought ranch seasoning to finish off the sauce for this Chicken Bacon Ranch Pasta. You guys know that I'm ALL about the 80/20 rule when it comes to eating well and I'm also down to take shortcuts. You may have some qualms about using a seasoning packet but it's truly the easiest way to get the ranch flavour while keeping the calorie count relatively low. If you are mostly cooking with whole foods you can afford to take a shortcut every once in a while, especially if you're as big a ranch fan as I am! I also like to use turkey bacon to keep calories down but if you're not as concerned about that go ahead and use real bacon! Leftovers from brunch usually work best and keep the prep time down but it's up to you. 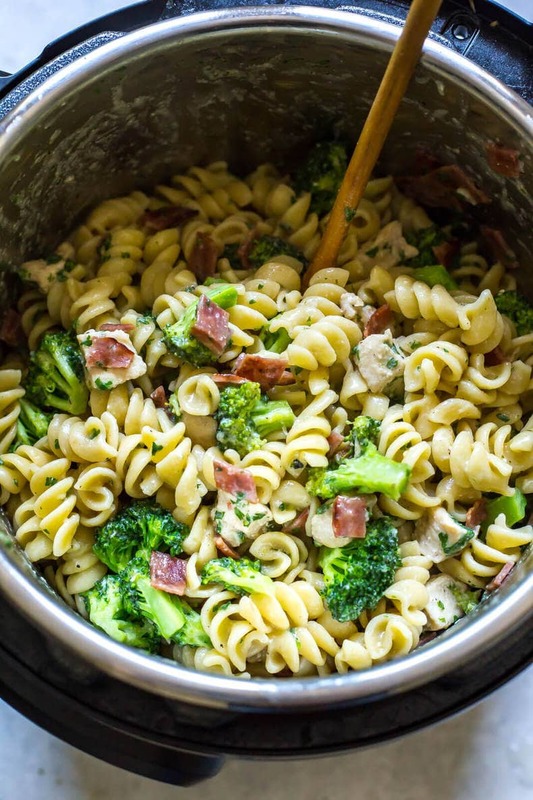 And honestly, this ranch pasta is so good you could probably even leave out the bacon and it would still taste amazing! 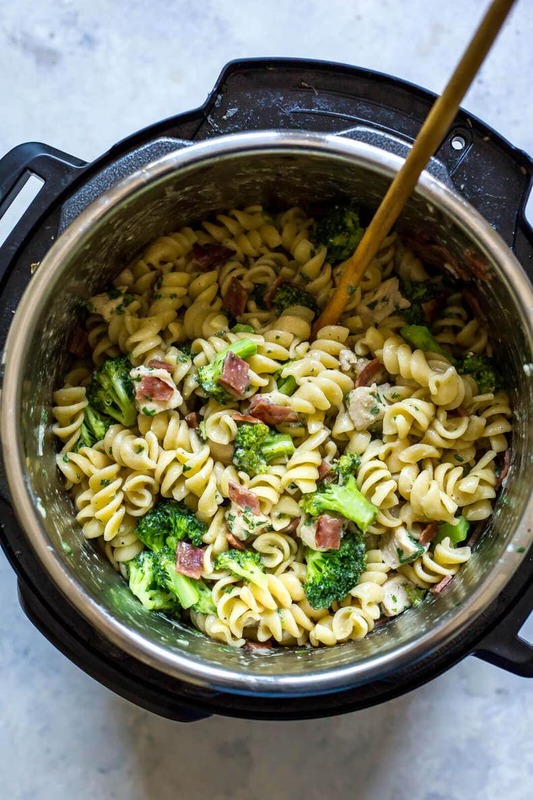 Just look at this big giant pot of delicious Instant Pot Pasta. I'm in love! A creamy, delicious sauce made easy thanks to Greek yogurt, and a ton of protein thanks to the chicken and bacon. 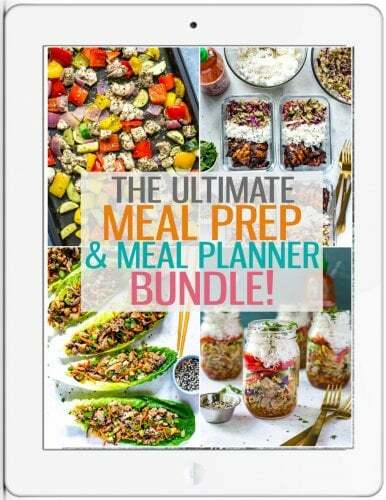 It's definitely an all-in-one dinner idea that you're going to love and add to your regular rotation! 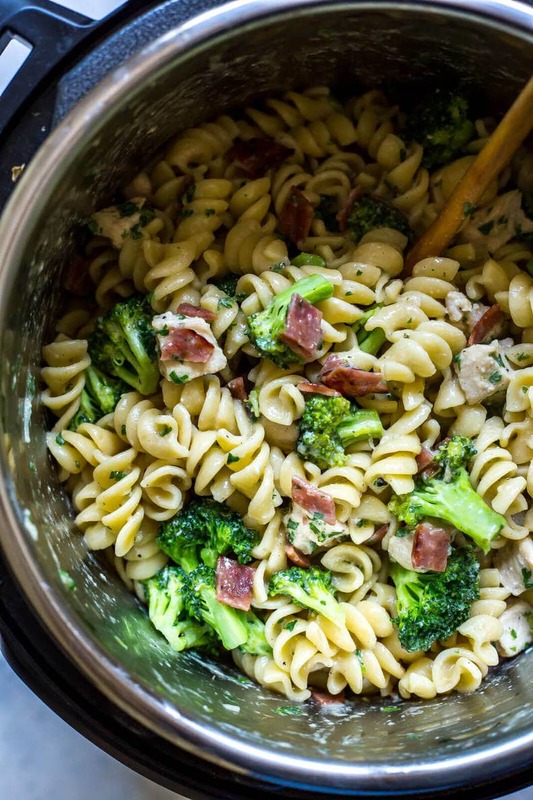 Will you be making this Instant Pot Chicken Bacon Ranch Pasta? 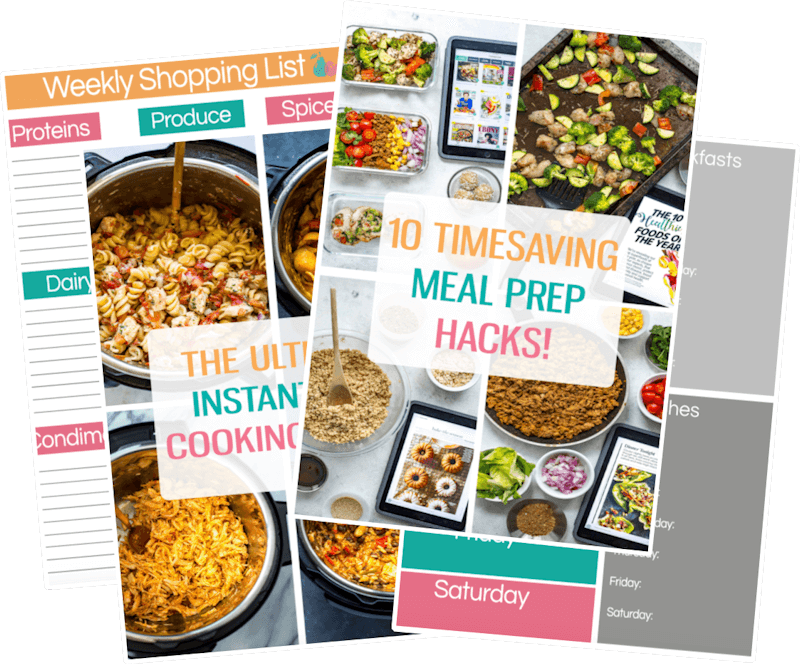 When meal prep is this easy and delicious, it's hard to see how you couldn't just set aside the tiniest bit of time each weekend to get yourself organized for the week. And I mean, this pasta is so easy that you could even make it last minute on a Monday night after work – just dump everything into the one pot and enjoy! Grab some Glass meal prep bowls if you plan on packing this pasta up for lunch! This is the pasta I used in this recipe. 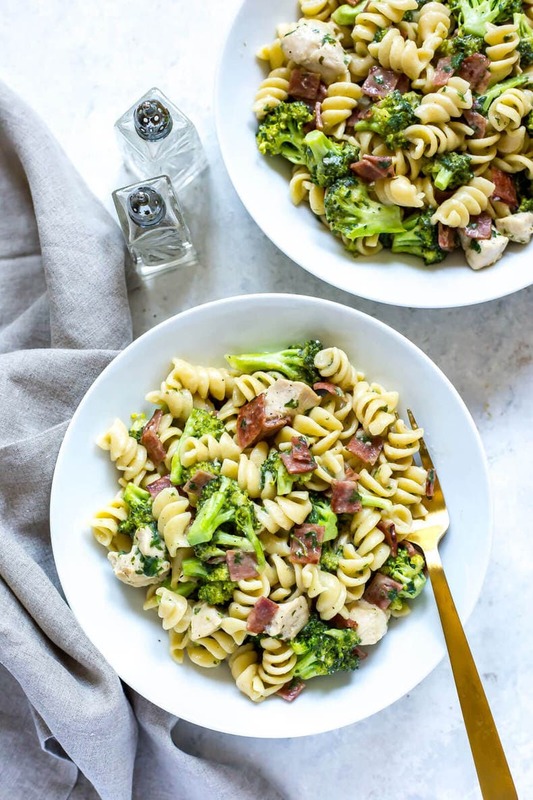 This Instant Pot Chicken Bacon Ranch Pasta is a delicious one pot dinner idea that comes together super easily in the pressure cooker - and it's made lighter with packaged ranch seasoning, turkey bacon and Greek yogurt! Add olive oil, chicken, garlic, ranch seasoning, salt and pepper, water and pasta to Instant Pot in that order. Cook on high for 3 minutes, then do a quick pressure release. Instant Pot will take 10-15 min to preheat then cook for 3 min on high pressure. While Instant Pot is preheating, cook turkey bacon with a bit of olive oil in a large skillet over med-high heat, cooking for 3-4 min per side. Remove from skillet when finished and chop up when cool enough to handle. Set aside. When pressure gauge is down and it is safe to do so, remove lid and stir in Greek yogurt and parmesan cheese until well combined. Mix in broccoli, parsley and cooked turkey bacon then let sit for 5-10 minutes (this will give broccoli time to steam and cook). Serve and enjoy! A question: do you use natural pressure release for this recipe? or quick release? Thanks! I used 4 cups of water and it finished with a lot of water left. I could of probably used 2 cups of water and cooked it for 4 minutes. I’m wondering if you maybe used a slightly different/smaller pasta shape (I know rotini can come in a smaller variety) or if you had just under 1lb of pasta..I’ve tried this manner of cooking pasta in the Instant Pot several times and I’ve never had a problem. Sorry it turned out watery for you Bogart! The pasta was delicious but i’m very disappointed reading the nutrition facts. One serving of this dish has 115% of your daily sodium allowance. No meal should ever consume your entire daily allowance. I wish I had read that before I made this dish but at least I know now. It’s a delicious dish but i’ll never make it again knowing there’s so much sodium in it. Hey Katie – I use a plugin to calculate the nutritional facts so this may be a glitch or miscalculation…the only areas where I see this meal being so high in sodium is the ranch packet and chicken broth and honestly I’m not sure if it’s a matter of these two ingredients being THAT high in sodium alone or if the plugin is miscalculating. The plugin may even just have a low threshold for what a daily sodium allowance should look like. There are a number of variables that could account for this reading of 115%. While I’m sure this meal would not exceed your daily allowance as my plugin suggests, it is still probably on the higher end. That said, not all recipes are going to fit perfectly into your nutritional needs and if you have a strict desire for a lower level of sodium, fat, sugar, calories, etc you could always look up the ingredients on a more accurate app like Myfitnesspal or My Plate ahead of time to ensure you know exactly what you’re eating. What is the serving size please? It was good, but Definitely too much water for me. I will use 2 cups next time! Hmm I’m wondering if you didn’t use a full pound of pasta (I know some boxes can be 340g instead of 454g, which is closer to 1lb). I find there’s no excess liquid at all with 4 cups of water. Glad that you liked it overall Candice!